The mineral waters come to the tubs hot from the earth at approximately 106°F. Sulphur, calcium, potassium, boron, and many other naturally occurring minerals are in abundance, making for a truly healthful and rejuvenating bath. Several underground springs are tapped to bring the water into our Bathhouse. Seven Victorian porcelain tubs continually fill with mineral water at an average temperature of 104°F. Five are in private rooms, while our two “Stargazing” tubs are on the Bathhouse deck. From these tubs bathers go to the communal tubs – one under a covered roof and one outdoors. These pools range in temperature from 104°F to 107°F. Clothing is optional. 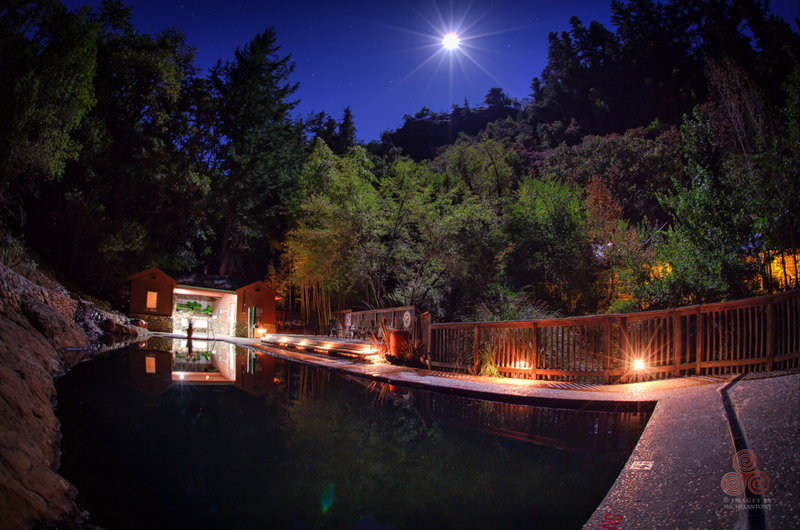 Several small springs, unaltered by chemicals, flow into our 15’ x 60’ cold pool, which is built directly into the rock of the hillside. This 60°-75°F spring-fed pool provides a refreshing change from the hot baths. Next to the swimming pool are our gas-fired Sauna and Steam rooms.